The Congress today paraded its 44 MLAs lodged in a resort on Bengaluru outskirts before media to scotch reports of disunity. BENGALURU: The Congress on Sunday acc­used BJP of offering Rs 15 crore for each Gujarat MLA to lure th­e­m to rival camp. Desperate to ke­­e­p its flock together ahead of the Rajya Sabha elections on August 8, Congress also alleged misuse of the CBI and Enforcement Directorate to split the party in Guj­a­rat. The MLAs, staying at a luxury resort on the outskirts of Bengaluru, tried to present a show of unity here on Sunday as all 44 of them came out to interact with the media. Of the 57 Congress MLAs in Gujarat, six resigned from the party in the last two days. Three of them joined the BJP on Saturday. “BJP is indulging in horse-trading. Our MLAs are being lured with offers of `15 crore each. They are even using CBI and ED to target our MLAs with threats of raids. BJP is using every trick to split the Congress in Gujarat. It is trying to lure 22 of our MLAs,” said Congress MLA from Gujarat and AICC spokesperson Shaktisinh Gohil. Speaking to reporters at the luxury resort, Gohil said he was concerned about the safety of their families. 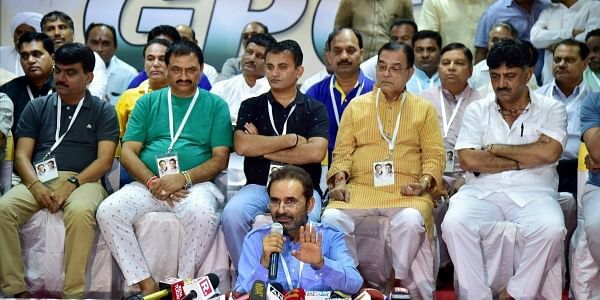 They are facing threat to their lives as the BJP is using blackmail tactics to split Congress in Gujarat, he said.Accusing the BJP of using all the foul means — intimidation, inducement, blackmail — Gohil said BJP is hitting below the belt and said democracy is passing through trying times in Gujarat. “Our fight is to save democracy,” he said. Gohil denied reports that they have been brought to Bengaluru forcibly. “We have come voluntarily to save democracy. There is no pressure or force. We are capable of facing any situation,” he claimed. The MLAs also denied reports of their mobiles being snatched to keep them away from the reach of BJP as they displayed their mobiles during the media interaction. He expressed confidence of Congress ensuring the victory of Ahmed Patel, Political Secretary to Congress supremo Sonia Gandhi in the Rajya Sabha polls. Congress has the required numbers with a total strength of 60 including support from NCP and independents. The party needs 45 votes to ensure victory of its candidate, he said. Meanhwile, members of Citizens for Democracy and many Gujaratis settled in Bengaluru staged a protest at Gandhi Statue near Maurya Circle against the resort stay of Gujarat Congress MLAs. Union minister Prakash Javadekar rejected the charge of BJP poaching and bribing Congress MLAs. “Gujarat Congress leaders are levelling allegations at the BJP in Bengaluru. It is like a thief criticising a cop,” he said in New Delhi.